Tapio Wirkkalas craftsmanship was expressed in all areas of artisanal production - glass, jewelry, ceramics and furniture. His flatware "TAPIO", and his hunting knives "PUUKKO" for Hackman Oy are among the most refined of all scandinavian designs. 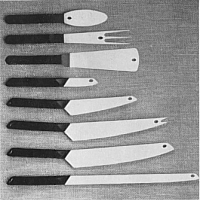 Wirkkala designed dozens of cutlery series, most of which never reached the production stage. "Finnpoints" was the only set of Kitchen Utensils designed by Wirkkala that finally was taken in production.